Page 4, February 1975, St. Louis — Federal Reserve Bank Review. A dictionary is an alphabetical list of words. This list of words is intended to convey the maximum in understanding. The object of the list is to set bounds to ideas. By reason of confining these ideas within limits, it makes them easy to understand. It is a simple truth that most of our ideas are mere clusters of notions, not clearly defined. They are vague, and this vagueness often leads to considerable practical difficulties. This is especially true in our nation where wealth and “money” are concerned. For centuries, wealth and “money” have been treated synonymously. In fact, one is tangible and the other intangible, respectively. In all the ramifications of economic knowledge, the art of distinguishing exactly between wealth and “money,” requires, above all, a clear idea of every item dealt with. The needs of the middle-class public have not hitherto been considered from this aspect. Most explanations of this subject have been prepared for technicians, most of whom have little need therefor. Yet even these may profit. This will be the most interesting of all books on this subject. It is more than that: it is the gateway to all other books on economic subjects since it makes clear the words these books must employ. 1. a. Disassociated from any specific instance (entity); b. Difficult to understand. 2. Expressing a quality apart from an object. Lasting for an immeasurably or indefinitely long period of time. Property owned; the delivered (received) portion of an exchange. Any result of human exertion accepted during an exchange that is equal in parity to the result of human exertion that is offered. 1. To acquire (property) by giving a price; purchase; opposed to sell. 3. Econ. : A stock of accumulated wealth; specif. : a. the amount of property owned by an individual or corporation at a specified time, as distinct from the income received during a given period; b. an aggregation of (economic) goods used to promote the production of other goods, instead of being valuable solely for immediate enjoyment. Wealth used in the production of more wealth; (all capital is wealth — all wealth is not capital). 2. a. piece of metal marked and issued by Governmental authority to be used as money; also, such pieces collectively. Obligation to pay; the undelivered (not received) portion of an exchange. 2. False belief; A fixed misconception; as, to cling to a delusion. Any result of human exertion offered during an exchange. 3. a. Any of various basic monetary units (as in U.S. and Canada) — see MONEY Table; b. a coin, note, or token representing one dollar. A unit in a system of monetary measurement, i.e. One DOLLAR = 100 CENTS — One CENT = 1/100th of a DOLLAR, which is a term to express the unit quantity of what ever is specified, by law, to be current as money within the United States (the money of account). OXYMORONIC: A combination of contradictory or incongruous words used in economic rhetoric to facilitate acceptance of a dollar standard of value as the price base accepted by the public. Skillful use of the artificial elegance of language in speech to psychologically induce the public to accept a concept of DEBT, viewed as an asset, being “MONETIZED” (transformed into money) and therefore spendable. 1. Act of giving or taking one thing in return for another as an equivalent; trade; specif., barter. Act of giving or taking any result of human exertion in return for another's result of human exertion that is equal in parity (exchange-value); (bartering). 2. Disproportionate and relatively sharp and sudden increase in the quantity of money and credit, or both, relative to goods available for purchase. Inflation always produces a rise in the price level. The imaginary “MONETIZED” debt, as an asset without parity, being accepted as a medium of exchange by the public (“money”). Anything customarily used as a medium of exchange and measure of value, as sheep, wampum, gold dust, etc. Any result of human exertion (barter) or “money” accepted during an exchange and used in subsequent exchanges. 1 a: Change of physical form, structure, or substance, esp. by super natural means; b: a striking alteration in appearance, character, or circumstances. To coin into money: also to establish as legal tender. OXYMORONIC: A combination of contradictory or incongruous words used to facilitate acceptance of a system of monetary measurement TERMS as denominated (named) units of ACTUAL VALUE. Debt coined into money: Debt established as legal tender. OXYMORONIC: A combination of contradictory or incongruous words used to produce the effect of debt being an asset, with parity, and accepted as a medium of exchange by the public (“money”). 3: A form or denomination of coin or paper money. An abstract term, mistakenly, applied to barter, and generally accepted by the public as a medium of exchange. 3. The difference between full parity and actual parity received during an exchange. NOTE (Webster): 9. c. A written or printed paper acknowledging a debt, and promising payment; as, a promissory note; bank note; a treasury note (note often being used alone for any such phrase. A combination of contradictory or incongruous words by which a locution produces an effect by a seeming self contradiction. 2. a. Equivalence of a commodity price expressed in one currency to its price expressed in another; b. equality of purchasing power established by law between different kinds of money at a given ratio. The exchange-value of one thing expressed in terms of another. 2. a. The quantity of one thing that is exchanged or demanded in barter or sale for another; b. the amount of money given or set as consideration for the sale of a specified thing. The parity of all other things expressed in terms of one specific thing generally accepted, mistakenly, as a standard unit of value. 2. a. Authority or power to act for another. 2. To obtain by paying money or its equivalent; to buy for a price. 3. To buy off or take up, as by payment, as, to redeem bank notes with coin. 1. Act of redeeming, or state of being redeemed; ransom; deliverance; reclamation. 2. Specif., the difference between the circulating value of a coin and the cost of the bullion and the minting. The difference between the accepted parity of circulating coins and their actual parity as commodities; (debt, money, and imaginary demand). 5. To transfer (property) for a consideration; to give up for a consideration; to convey; — opposed to buy. 2. Performance of labor for the benefit of another, or at another's command. 4. Econ. : The quantity of any article offered at a given price; Cf. demand. Any result of human exertion received during the instant of exchange. 4. A word or expression having a precisely limited meaning, or peculiar to a science, art, or the like, as, a technical term. 7. A piece of metal intended for currency issued at a nominal or face value in excess of its real value; hence, any piece of currency similarly issued or current. Any tangible thing that represents, by proxy, what it is not, and cannot redeem; i.e. paper and metal tokens (“dollar bills” and copper nickel coinage). 2. Any determinate amount or quantity (as of length, time, heat, value) adopted as a standard measurement. Note: The word value in the above example of ‘unit of value' shown by Mr. Webster is a mistaken application. There cannot be a standard unit of value measurement! Value is a subjective evaluation of human satisfaction derived from the possession or use of some thing. Every human establishes an individual sense of value;. There are no fixed units of value. 10. Econ., a. Efficiency in exchange; purchasing power; b. proper price; the quantity of money, goods, or services, which an article is likely to command in the long run, as distinct from its price in an individual instance; c. the estimate which an individual places upon some of his possessions as compared with others, independently of any intent to sell. The amount of human satisfaction derived from the possession or use of some thing. 3. Econ., a. In the private sense, all property which has a money value; b. in the public sense all objects, esp. material objects, which have economic utility. 3. Having wealth to the value of. The anticipated amount of human satisfaction to be derived from the acquisition or use of some thing by others. To ACCUMULATE units of “monetized” debt in lieu of seeking full-parity return on human exertion (product or service) given up. ACCUMULATING “monetized” debt “units” in an act of supporting a false concept of non-existent monetary “units of value,” by financing the ISSUANCE of the “units” of “monetized” debt. 2. The acquisition of possessions off-record (secretly). There is no law of SUPPLY vs. DEMAND! ‘Supply' and ‘Demand' are abstract terms existing only momentarily during an exchange. To the Fisherman: Eggs RECEIVED are ‘SUPPLY' — his fish OFFERED are ‘DEMAND'. The only difference existing between the words ‘SUPPLY' and ‘DEMAND' is one of VIEWPOINT during the instant of exchange, by the parties exchanging. After the exchange, that which is received by each of them becomes either INVENTORY, WEALTH, OR CAPITAL! The word ‘DOLLAR' is a monetary measurement term; like Inch, Ounce, Quart, and Peck, it is not a tangible entity and hasn’t any material substance. There are no ‘DOLLARS' per se! "Monetized” debt exists only in the human mind. It is intangible. “Dollars” of “monetized” debt cannot exist without human make-believe; even air and sunlight can be observed and measured — “Dollars” of “monetized” debt (“money”) cannot! The words, Buy, Sell, and Purchase, are all words designed to support and justify exchanges where one party accepts tokens representing a non-existent parity called “money” (“monetized” debt), in lieu of a full parity product or service (result of human exertion). Goods and services are words used to obfuscate the fact that in simple terms, exchanges are ALWAYS exchanges of the RESULT of one human's exertion (product or service) in return for the RESULT of another human's exertion (product or service); i.e., ‘BARTERING' — EXCEPT — when one party accepts a token which, by its nature, is not full parity. This induces the false concept of the “monetized” debt (the undelivered — not received portion of the exchange) being “money." The word VALUE is used much too often in place of the word PARITY. This misuse of the word, value, distorts the entire truth of exchanges. The commonly accepted “rule of thumb": “ A thing is worth what you can get for it!,” is a case in point; it is not true. Value is a subjective evaluation of a thing used or possessed. Parity is the expression of that appraisal in terms of another thing. VALUE IS A SUBJECTIVE APPRAISAL. WORTH IS AN APPRAISAL BY ANOTHER. PARITY IS AN EXCHANGE — VALUE / WORTH — ESTABLISHED BY AN EXCHANGE. At any time, a token representing “monetized” debt conveys no ownership of anything, but its own content of material commodity. Holding it over time funds its issuance. Until it is passed on, its holder has received “nothing” for the results of human exertion (product or service) given up. Only if it is subsequently passed on will its former holder know what result of human exertion (product or service) he has received for his earlier offering in exchange. In a sense, perhaps, a sort-of indirect, deferred “barter. However, the great volume of tokens being accumulated guarantees that countless numbers of holders of “monetized” debt tokens will never get any return! When many and varied things were used as mediums of exchange they were items of BARTER referred to by a general term MONEY; i.e. Ax Handles, Corn, Tobacco, Grain, Gold, and Silver. The GENERAL TERM money referred to perceivable objects of a material nature. When (June 24, 1968) the LAST perceivable object of a material nature (Silver) was removed from reference AS money and replaced exclusively by “monetized” debt of oxymoronic nature the GENERAL term MONEY became an EXCLUSIVE reference to an ABSTRACT. In all labor there is profit! A service performed is as worthy of parity as a product. All human exertion results in either a product, an increase in personal ability, or a service performed. Everything on Earth outside of mankind and the results of human labor is a resource. Human exertion applied to resources RESULTS in TANGIBLE wealth. Human exertion applied to personal ability RESULTS in a wealth of skill. Human exertion applied to the benefit of others RESULTS in a wealth of service. CAPITAL is a much misused term. Most often used mistakenly in reference to money. Tangible wealth that results from human exertion, used as a tool to increase the production of wealth, is CAPITAL; i.e., A chair in the home is tangible wealth, in a RESTAURANT that same chair would be capital. INFLATION is a THING not a condition. Inflation CAUSES “rising prices.” “Rising prices” are the result of a lowering in the parity of the accepted “money.” The IMPOSSIBLE nature* of “monetized” debt is the reason for its parity lowering, therefore the “money” is the INFLATION per se. *MONETIZED DEBT NEGATES THE PAYMENT OF DEBT. THE TOKENS MUST ACCUMULATE AND BE BID IN EVER LARGER QUANTITIES! DEBT, as an obligation to pay, has to be an undelivered portion of an exchange. MONEY, as an accepted means of payment, would have to be considered a delivered portion of an exchange. For DEBT to be money by “monetization,” then DEBT would have to be the UNDELIVERED and the DELIVERED portion at the same time, and that can not be! BARTER (with parity) as a result of human exertion could be used in subsequent exchanges as well as the imaginary “money” (without parity). “Money” and Barter were both accepted as MEDIUMS OF EXCHANGE and resulted in BARTER being referred to AS money (generally accepted term for a medium of exchange), but the difference is distinct: Barter can be barter and/or a medium of exchange, but “money” can ONLY be ACCEPTED AS a medium of exchange. When there “is” an accepted “unit of value,” all other things with parities expressed in terms of that “unit of value” are called PRICES. Since “monetized” debt has no value at all there is no basis for the use of the term price except in FANTASY. When gold and/or silver coin was in use they were respectively units of PARITY for ‘PRICE' comparison. SEIGNIORAGE is something taken by virtue of sovereign prerogative. However, the seigniorage taken from the issuance of copper-nickel coinage is about ninety-seven percent. Taking (97%) “OFF THE TOP” does not leave much to be taxed: It should also be pointed out that in a REPUBLIC, the people are the sovereigns not their elected officials. Redemption of specie was ON DEMAND. Turning in the gold and/or silver certificates permitted their hold to regain possession of the precious metal coin itself. The issuer of the certificates (holder of the deposited coins) allowed the holder of the paper to REDEEM his coins FROM the ISSUER of the paper. The precious metal coins were deposited, the paper we held, but NOW the paper will only reclaim copper-nickel tokens. The holder of the precious metal coin melted them down, sold the gold and silver, and replaced our deposited gold and silver coin with base metal token. THE PUBLIC HAS BEEN ROBBED AND WILL NOT BELIEVE IT! If you find the JENKINS definitions too confining, remember that for any scientific approach to any subject there can only be one definition for any given term. If any term “enjoys” TWO “definitions” It has not been defined! The world is sick with a recurring disease. It is a disease that is most distasteful to discuss, most unpleasant to acknowledge a because of man's short life span lies dormant of suspicion for many generations. Evil men plot to rule the world. In the “old” days it was to conquer the world, make all its inhabitants slaves, accomplishing the deed with the sword. In the “modern” world it is approaching fruition by the subtle, clever, almost undetectable means of “monetizing debt.” “Monetizing debt” is a contradictive phrase which at first appears as though it would be impossible to inflict upon the mind of thinking man. That it has been done is fact. How it has been done will be explained later in this text. It is the why it has been done that is the most important to reveal and the most “unbelievable truth” to accept. To conquer the world, and do it without the sword, the conquerors must be clever and secretive. It is necessary to reduce thinking man to the level of unthinking animal and keep him there happy and unaware that he has been reduced to that level. In every civilization that has collapsed it has been at the height of its “bread and circus” era. Careful observation should reveal that the present world is now at its highest level of “bread and circuses” (extremely high levels of welfare and concentration on sports). That we are at the reverse of gaining wisdom and at the extreme of becoming unthinking animals we are today graduating students unable to fill out job application forms. We speak in Specific Generalities and have all but lost our ability to communicate with meaningful definitions. To conquer the world and make all its inhabitants slaves without their awareness or even suspicion is a clever and unbelievable accomplishment, but it is fact. It has been done and I am one of the slaves. It would not do any good or serve any purpose to just tell the names, make the denouncements and hope that justice would prevail; that has been tried many times in the past. The power I am speaking of would simply destroy me and go right on about its business. If, however, I can convince that power of certain consequences that are about to occur and those consequences are equally as distasteful to them we may be able to enlist their aid in bringing about the cure for the disease. Every Doctor knows it is almost impossible to cure a patient that is lacking the will to live. Medicine is hard to administer to a patient that feels well and doesn’t believe he is sick. The world is sick, but the majority of people are totally unaware of it because of the “bread and circuses.” To expose the disease it is necessary to call attention to the symptoms and show that those symptoms are definitely those of this specific disease and not just coincidental. To conquer the world and make all its inhabitants slaves the conqueror would have to have the means of supporting them. The support must come from THEM (the slaves), but APPEAR to come from the slave master. Let me show how it was done to the last few generations in the last six decades. First the would be conqueror creates liquidity crises to bring on financial crisis and rioting. You convince the public that using a medium of exchange that is full parity cannot support the exchange of all production. The way is then clear to create a Monetary Authority to create an “edict money” (fiat) which the people accept because of their great CONFIDENCE in “their” elected officials. Once the would be conqueror has the power to create money, any amount of it, he now has the means with which to support the slaves. The next step is to destroy their independent means of support. Minimum laws accomplish this very nicely putting great numbers of people below the level of income and onto the rolls of the unemployed. Great armies of people are required to SERVICE the unemployed and of course these armies are dependent on the “edict money” payroll. Next they must introduce an income tax the excuse for which is the great increased cost of government largess to the poor and deserving. The income tax must be design to escalate with time, but not compensate with its allowances so that, with time, all who must pay gradually become unable to stay in business and support themselves independently. This is accomplished by the naughty advances of “INFLATION” and the lack of compensation in depreciation allowances etc. To further “sink the hook” they give the taxpayers TAX ALLOWANCES for increased “Capital Expenditures” which drives the business man further into the arms of the money creators and a greater interest burden which, in reality, hastens his financial collapse. The accompanying Social Security Acts — Socialized Medicine etc. are very effective along with Revenue Sharing, Matching Funds etc., before unthinking man can even become suspicious of it he is totally dependent on the largess of the money creator and a slave through subsidies which make the subsidizer the “SILENT,” but SENIOR partner. The slaves produce the goods and services and exchange them, for the fiat created by 14,700 commercial banks in the United States. 6000 of the Commercial Banks are members of the Federal Reserve System, but all are controlled by the Monetary Authority which does not take orders from the President, the Congress, or the people. Page 14, Parade Magazine October 26, 1975. Page 24, Federal Reserve Bank of St. Louis Review August 1971. Page 21, “I Bet You Thought” Federal Reserve Bank of New York. This group of “people” run the rest of the public just like a herd of cattle. A public who works for the fiat (“Edict Money”), (“Monetized debt”), accepting pieces of green paper as that “money” never realizing that the creators of that paper get it for nothing. The public who works for “Money” is constantly OUTBID in the economy for the goods and services they produce, by the people who are the creators of “money” who get it for nothing. Thus those who slave to produce never realize the SUBSIDY that keeps them supported came from their own exertion. The support comes from their own efforts, but appears to come from the slave master; such is the nature of “Monetized Debt” Slavery. Last Page, “The National Debt” Philadelphia Federal Reserve Bank. This is one of the times during the span of life when it is necessary to determine priorities concerning duty, patriotism, foolishness, virtue, honor and self-preservation. This is one of those times. It involves everyone who has love of self, love of family, and love of country. This existing condition has such tremendous potential for disaster that it would be “suicide” for elected officials to correct it without first exposing it. It concerns the significant fact that as of June 24, 1968 the United States of America ceased to have, by law, a “money” of account. Without one there isn’t any THING for the monetary system to measure and the “dollar” per se does not “exist.” Contracts specifying payment in “dollars” are impossible to pay. All requirement to specify amounts of “dollars” received or paid are impossible without unlawful falsification which in many cases is a punishable crime. Right or wrong Congress may have the power to declare what is to be, by law, current as “money” within the United States, but has neglected to make the new specification. The people are caught in a very perilous situation. “Truth is stranger than fiction” will become fact to those that accept the “unbelievable” truth as described above. For many people, to accept the above scenario as fact, will be a very difficult decision. However, I would not have written it if I did not believe I had found a way to have it accepted. For myself, nothing is totally acceptable unless I understand it. It is lack of understanding that keeps us forever overcome with confusion and indecision. As humans we tend to accept things on the basis of the credentials of the person offering the scenario, but then that is not exercising our mental capacity to think. I do not wish for anyone to accept what I say merely because I said it. Study the following explanation of how “… the great body of people … “ came to accept a totally illogical concept (“monetized” debt) through ‘ACCIDENTAL' or ‘DESIGNED' conditioned reflex, and you will either gain tremendous understanding of the “… system … “ or remain no worse-off for the effort. Federal Reserve ‘Note' pseudo proxy stand-in! Something or someone that is authorized to act for another. Being authorized to act for another does not endow the PROXY with aspects of the other it represents! A silver coin as wealth on deposit will justify its depositor to hold a receipt for its deposit in the form of a paper token. The paper token may be used AS a negotiable instrument, but its nature of being a PROXY must never be forgotten even for an instant. Ten silver coins as wealth on deposit will justify its depositor holding a paper token receipt AS a negotiable representative of those ten coins, but here it is easier to recognize its PROXY function because the single piece of paper token could not possibly be TEN of anything! The PROXY nature of “silver” certificates has been completely obscured by years of acceptance as their being the things they represented. So much so that today the public resists vehemently the truth that the paper certificates were no part of the so-called “money” volume. The “silver” certificates (they were actually colored: green and black on a white background) were called ‘silver' certificates because they were usable to redeem deposited silver coin. The ability to redeem specie (wealth in coin form on deposit) allowed the public to acquire the habit of considering them AS GOOD AS the silver coin they called “money.” This led to the eventual totally obscured truth of the paper token's nature AS A PROXY device. The very nature of a token is that it represents WHAT IT IS NOT! Since the paper tokens (“silver” certificates) were, over the years of use, accepted by the public as being the “money” (the thing they only represented), the silver coins and the paper tokens were accepted in commerce AS having EQUAL value. They existed side by side in the market place freely exchanging one for the other. This general acceptance allowed an illogical concept to be born that: Anything accepted by the public AS “money” is ‘money' by that acceptance. As long as the paper tokens circulating were only issued upon the deposit of silver coin held for redemption there could be no harm in this PUBLIC DELUSION. As long as there was SPECIE (silver coin) on deposit to be redeemed, the paper token did have the AURA of value of the silver coin it could redeem. However, with the introduction of Federal Reserve “notes” the entire PUBLIC DELUSION became the result of a Criminal Act: FRAUD! The federal reserve “note” is issued in almost the exact image of the “silver” certificate. Its acceptance alongside the “silver” certificate was a natural. The public in ‘supported' delusion accepted the federal reserve “note” AS “money” AS having equal value with silver coin. Supported by the fact that federal reserve “notes” were able to redeem silver coin (specie) even though they (the paper token) had not been issued as RECEIPTS for the deposit of silver coin. The federal reserve “note's” nature as a PSEUDO proxy device “for silver coin” was never even contemplated by the general public. What had been a harmless public DELUSION, in the presence of an exclusive 100% redeemable for specie proxy environment, now became a systematic, relentless expropriation of the public's wealth by FRAUD! The difference is that, BEFORE, the silver coin was called “money but WAS wealth (product of human exertion) and, NOW, the wealth (silver coin) has been PSEUDO replaced with slugs (copper-nickel tokens). We now have TWO SETS of PROXY tokens; metal and paper. The Federal Reserve “note,” which before was a PSEUDO proxy for the former silver coinage, is now a co-proxy with the copper-nickel slugs for a third “entity” which REALLY replaced the silver coin AS the “money.” The copper-nickel slugs only replaced the silver coinage to the extent of 3%. 97% of the role of silver coinage AS “money” has been “replaced” by an imaginary medium called ‘demand deposits' or commercial bank liabilities. The form of the replacement is as numbers (mere digits) on the ledgers of the commercial banks created during the process of “monetizing” a borrower's debt. The commercial banks in making loans create demand deposits (numbers) in the ledgers which the borrowers enter on their check books and “spend” by issuing checks. A process which embodies the essence of the acceptance of such an illogical concept as “monetized debt” (debt converted into money). The “money” today is mere digits — no longer silver coin — and the “money” is born on the ledgers of the privately owned commercial banks during the process of “monetizing” borrower's debt. Modern “money is NOT deposited in banks by depositors! Page 19, “I Bet You Thought” N.Y. Fed. Res. Bank. Page 17, “I Bet You Thought” N.Y. Fed. Res. Bank. Checks, metal tokens (copper-nickel slugs) and paper tokens (federal reserve “notes”) are NOT cash, even though the public looks upon the metal and paper tokens AS cash. The true relationship of the coins and bills to modern “money” is UNIQUE! The nature of modern “money” itself is UNIQUE, in that, being totally non-existent it still is PERCEIVED by multi-millions of people as being a medium of exchange. A medium of exchange existing only by virtue of the tangibility of its PROXY REPRESENTATIVES and the RESIDUAL MEMORY of the wealth that used to be recorded with numbers and symbols in a double-entry bookkeeping system that is the sole survivor of the METAMORPHOSIS described above. The actual “thing” used today as modern “money” is a “license to steal” issued by a commercial bank in the process of making a loan. The permission to put digits in your checkbook and spend them is the birth of “purchasing” power without the formality of first having to produce wealth before using it in exchange. You spend your digits by writing checks against a non-existent deposit which is STEALING BY FRAUD. Page 4, “Modern Money Mechanics” Chicago Fed. Res. Bank. Page 7, Two Faces of Debt, Chicago Fed. Res. Bank. Page 6, Two Faces of Debt, Chicago Fed. Res. Bank. The public delusion that the paper and metal tokens are cash and part of the “money” volume is SUPPORTED by the ambiguous language of the Monetary Authorities. Page 3, “Modern Money Mechanics” Chicago Fed. Res. Bank. Page 1, Letter 6-23-78 from Dorothy M. Nichols Vice President and Economic Adviser of Federal Reserve Bank of Chicago. It is also this line of illogical “reasoning” that allows impossible statements to stand unchallenged by the general public. “… with respect to the conversion of deposits into currency … If a check is “cashed” and the payee requests currency, the money supply is unchanged but the deposit component declines while the currency component increases. The deposit of the payor is reduced and is not offset by an increase in anyone else's deposits. THINK! “… the money supply is unchanged but the deposit component declines… .” As established earlier, in the FACTUAL sense, only demand deposits are the “money.” In the FACTUAL sense then, the statement “… the money supply is UNCHANGED but the deposit component DECLINES …” is an impossible statement because it would have you believe that the books are BALANCED (“… unchanged … “) and UNBALANCED (“the deposit of the payor is reduced and is not offset by an increase in anyone else's deposits.”) at the same time. In double-entry bookkeeping every debit must be offset with a credit; it is the very nature of double-entry books to be in constant and perpetual balance. When the statement: “The deposit of the payor is reduced and is not offset by an increase in anyone else's deposit.” it is what is ‘OMITTED' from that statement that explains the ‘impossible.' The statement should have been “The deposit of the non-bank payor is reduced and is not offset by an increase in any other non-bank individual's deposit. When the bank “cashes” the check for the non-bank payor it reduces his deposit component and increases the BANKS' deposit component which keeps the books balanced and the “money” volume UNCHANGED. When it takes paper tokens from the vault to give to the non-bank payee it INCREASES the “currency” component by virtue of the fact that the paper tokens will be considered by the non-bank payee to be “money” in the FUNCTIONAL sense. The paper tokens handed out (when “cashing” the nonbank payor's check) are not “money” in the FACTUAL sense and are NOT, REPEAT, NOT recorded as such in the banks ledgers. The belief that banks can CONVERT (transform) numbers on a ledger into pieces of green paper and/or copper-nickel slugs is illogical and unreasonable, but has nevertheless become accepted as fact in the public mind. The true function of the paper and metal tokens is to facilitate an acceptance of themselves as cash. Their acceptance as cash bolsters the residual memory of the stability and discipline of full parity, tangible mediums of exchange without the positive restraints that discipline had on expropriation and redistribution of the public's wealth without the public's knowledge. Another function of paper and metal tokens is to facilitate a physical means of transferring ledger account balances from one bank in the system to another without the use of checks which totally destroy privacy of financial transactions. The paper and metal tokens have no more connection to the amount of “money” than the “supply” of unused poker chips. When a non-bank payee “cashes” a check, his (as payor) deposit component is reduced, the bankers’ deposit component is increased and the non-bank payee/payor is given the paper and/or metal tokens from the vault in amount equal to the check “cashed.” In no way did the non-bank payee/payor “WITHDRAW” numbers (“money”) from the bank or banking system. When a non-bank individual takes paper and/or metal tokens to the bank his deposit component is increased, the bankers’ deposit component is reduced and the paper and/or metal tokens are added to others in the vault. In no way did the non-bank individual “DEPOSIT” numbers (“money”) into the bank or banking system. In this manner the physical paper and/or metal tokens seem to function as did the “silver” certificates of old. The federal reserve “notes” and copper-nickel slugs act AS PSEUDO PROXY REPRESENTATIVES of a “money” that does not exist, as deposited wealth or anything else, but which is accepted as existing because of its mistakenly accepted “REPRESENTATION” by physical tangible tokens. The conditions described above in these pages of logic and reason cannot be ignored forever. The argument, as to whether this “unbelievable” truth is the result of mere inept bumbling of elected officials or the perpetuation of a ‘modern manifestation' of an aeonic conspiracy, must be faced by all those who still exercise their mental capacity to think! In an effort to provide the inputs that will facilitate reaching an objective conclusion of ‘modern ineptness' or ‘perpetuated aeonic conspiracy' I have prepared several comprehensive, though simulated, debates for study. The following debate did not actually take place, but all ‘ANSWERS' were taken from published material of the sources indicated. Answer: "MONETARY ASSETS are claims to fixed amount of dollars." Answer: "It works basically as follows. A bureaucrat goes to a businessman and says, “Why are you increasing your prices?” And the businessman says, “Because our costs are rising.” And then the bureaucrat says, “What is your major cost?” And the businessman says, “Labor." Monetary Realist: "Do you mean that there is an ‘inflation' that is a cause and another kind that is an affect, of that cause?" Monetary Realist: "That's just another way of saying that ‘prices rising' (falling “dollar” parity) is the inflation, but Webster's definition says that ‘rising prices' are the effect of inflation. Inflation cannot be its own cause and effect. Answer: Dear Mr. Ichord: I am writing in response to your recent letter regarding the gold exchange between the Federal Reserve and Department of the Treasury. On December 9, 1974, the U.S. Treasury purchased all of the gold ($85 million) held by the Treasury Exchange Stabilization Fund; this increased the Fund's holdings of dollars by $85 million. The Treasury then issued gold certificates to the Federal Reserve System against the $85 million purchased from the Fund and against $106 million of gold that had been held in the Treasury general fund. The Federal Reserve in turn credited the Treasury with $191 million on its books. Thus, as of December 9, gold certificates have been issued to the Federal Reserve against all of the gold ($11,652 million) owned by the Treasury. The gold transactions on December 9, were at the rate of $42.22 a fine ounce, the official U.S. price of gold. Letter to: The Honorable Richard H. Ichord, Jan. 15,1975. From: Board of Governors Federal Reserve System. It is imperative that all people acquaint themselves with the consequonces of the above, as soon as possible. Having studied the account of how “… the great body of people …” became totally ‘possessed' by an illogical concept (“monetized” debt), and having studied the accurate, though simulated debates, it is time to introduce you to another seemingly “unbelievable” truth, “income” tax. How “income” tax is an ever expanding, supporting force to perpetuate the disease. “Income” tax is a suffocating yoke upon all those who will not question it, but “… bear its burdens without complaint … ;” “Income” tax is like a trap for unwary animals; it is a tremendous tool, in the hands of the Internal Revenue Service, to keep “… the great body of people …” under control by fear. The people are so in fear of I.R.S. that even being told: “Income” tax is voluntary” they still fear being prosecuted for failure to volunteer. Not one person could send I.R.S. a 1040 “return” without, in effect bearing false witness against themselves. The filing of a form 1040 invokes the jurisdiction of the I.R.S. over the person filing. Anyone placing themselves under the I.R.S. jurisdiction has, in effect, renounced the 4th and 5th amendment protections of the U.S. Constitution. The document filed (“return”) gives the I.R.S. equity power over you. Without your acceptance of I.R.S. rules & regulations the I.R.S. could not force you to keep records, submit records, or file a “return." Only those who have a tax liability “must file;” 'unrequired' filing ‘opens the door' to I.R.S. to invade your privacy. The I.R.S. computer, in the case of a salaried employee, will ‘trip' when enough W2 forms have recorded “income” without a “return” filed to cover it. In that event the I.R.S. should compute the tax and bill the employee. When I.R.S. says it must know your expenses, deductions etc., your answering their questions is the of your violating your own privacy by giving I.R.S. that information. If the tax was lawful I.R.S. would compute it and send you a bill. It seems quite clear that you cannot follow both the U.S. Constitution and the I.R.S. Code; which one you choose determines your fate. If you choose the I.R.S. Code the Constitution stands repudiated by you. The I.R.S. uses the form 1040 as their justification for involving themselves in your affairs and as a “club” to beat you with; even to the point of twisting the logic that would ordinarily expose their careless disregard for the law. Case in point: WILLFUL FAILURE TO FILE. You must file in order to be accused and prosecuted for not filing, repeat, you must FILE in order to be accused and prosecuted for NOT FILING! The Willful Failure to File prosecution is based upon an I.R.S. determination that, for their purposes, the document FILED does not constitute a “return,” therefore, you did not file a “return,” BUT WITHOUT a document, to be declared NOT A “RETURN,” there could not be a prosecution for not filing. This is very significant for they must produce the document in court to show jurisdiction over you and then denounce it as ‘NOT A “RETURN"' for them to prosecute on ‘Willful Failure to File'. I.R.S. wants it, and gets it, BOTH WAYS, it is a “return” (for purposes of giving them jurisdiction) it is not a “return” (for purposes of prosecution for willful failure to file). Believe it or not the DOCUMENT FILED is used as ‘the evidence' to prove it was NOT FILED. This is, next to the HOAX of “money” itself, a most unbelievable act to witness or experience. Without a document from you the I.R.S. would not have a document to be declared ‘NOT A “RETURN"' and could not prosecute for willful failure to file. Only those with a tax liability “MUST FILE.” You cannot bill yourself without violating your protection under the U.S. Constitution. I.R.S. cannot bill you without knowing your financial affairs, INFORMATION, which they cannot get without violating your right to privacy. The I.R.S. can only act if you invoke their “service” by submitting a form 1040 to them, voluntarily, and in so doing you are repudiating your Constitutional protection, which prevents the use of that protection later, because YOU cannot have it BOTH ways. You cannot repudiate the Constitution and invoke its protection at the same time. The so-called ‘FIFTH AMENDMENT' return is an inadvertent trap. Making the “return” per se violates the protection of the Constitution, therefore it is inconsistent to believe that the document, as evidence of violation, can at the same instant be the document invoking the very protection it violates. If ‘taking the fifth' is a protection for the criminal; a noncriminal “invoking” the fifth, on a “return,” is making a FALSE statement. Not filing a “return” at all seems the most logical way of MAINTAINING the protection of the Constitution; you are secure in your “… person, houses, papers, and effects …” by virtue of not having violated that security by VOLUNTARILY filing a form 1040. The form 1040 is for use by those who have a tax liability, therefore, filing a form 1040 is proclamation that the person filing considers himself to have a tax liability. Anyone filing a form 1040 is filing a fraudulent document if it contains any reference to “dollars” or “dollar” values received as “income;” the word ‘dollar' denotes a quantity. The word ‘dollar' has no material substance. The word ‘dollar' is an expression in speech, it is not a tangible thing that can be received by any human for any purpose. To say you received ‘dollars' is a false statement and the document filed is fraudulent on its face. I have heard the statement “filing a form 1040 does not violate your fifth amendment ‘rights'” on several occasions. From the viewpoint of a criminal I believe that is correct. I believe that as a viewpoint upon which that statement is based, BUT from the viewpoint of an honest would-be taxpayer that is not correct. I believe that anyone filing a form 1040 is, in its filing, waiving his protection under the 4th & 5th amendments to the U.S. Constitution. Once having filed any forms 1040 or other document with an administrative agency operating outside U.S. Constitutional Law, you have established that agency as having a bond over you to comply with their jurisdiction. You have established yourself as having a DUTY to obey them; they are an AUTHORITY over you. Once having “created” an AUTHORITY over yourself, it is difficult to remove it and return to having individual liberty. I.R.S., as an AUTHORITY, in possession of a form 1040 , already has a powerful strangle hold on its victim. capable of suppressing ALL FREEDOMS, by the very fact that the ‘filer' submitted a false document in invoking their authority. There not being any “dollars” per se, there not being any “dollar” values, there not being any “income” per se gives I.R.S. unlimited avenues of attack on whatever statements are made on the form 1040. “Income” is a word, an expression of speech, to denote an advent or condition of receiving some thing or things, but it is not a tangible thing per se. Can you describe an ‘income' per se without having to visualize some tangible THING received? “Income” (which doesn’t exist) is usually measured in “money” (which doesn’t exist) which is expressed in “dollars” (which do not exist), therefore, no matter what statements are made concerning “income,” “money,” or “dollars” on the form 1040, it is a fraudulent document and it is open to arbitrary attack by I.R.S., once you give them the opportunity by filing a form 1040. FOR PROSECUTION TO TAKE PLACE THERE MUST BE EVIDENCE TO SUBMIT. WHAT BETTER EVIDENCE WOULD ANY PROSECUTOR WANT THAN THE DEFENDANT'S OWN, VOLUNTARILY SUBMITTED, FALSE AND/OR FRAUDULENT FORM 1040? WHATEVER YOU SAY CAN BE USED AGAINST YOU! A would-be taxpayer is treated worse than a suspected criminal. The suspected criminal is at least given a ‘MIRANDA DECISION' warning. The would-be honest taxpayer is purposely led into the trap. They supply the rope (1040 forms) and you obligingly hang yourself with it. The I.R.S. waits patiently, grinning, with their hands on the trap door latches. Like Lemmings to the sea, by the millions, you trudge to the mail box to send your self-destructing documents to I.R.S. every year. Like Lemmings, totally unaware, of the dire consequences of doing it. For the dumb animals there is an excuse; for intelligent thinking animals (humans) there is no excuse. To stop, think, and then act is not too great a price to pay for individual liberty. It is acting, conventionally with others, without thinking it out as individuals, concerned with individual consequences, that has allowed this condition (I.R.S. Tyranny) to gradually, almost totally, destroy individual liberty. The U.S. Constitution is hanging by a thread — we must reweave it Hawser before it is too late! Is it possible to remove this yoke of evil (I.R.S.) once it has been “fastened” about you neck with its critical strangle hold? Is it possible to return to individual liberty and the U.S. Constitutional guarantees of being secure in your “… person, houses, paper and effects … ?” I believe that the U.S. Constitution is still there and that it can still protect anyone who will support and defend it. I have renounced all my foolish, unthinking, former forms 1040 as being documents filed in error. I have asked I.R.S. to refund all amounts accepted from me since June 24, 1968. I have reaffirmed my desire to obey the law of the land (U.S. Constitution) and I have no intention of ever making any false statements or filing any fraudulent documents. In these actions I have made the attempt to break whatever “BOND” I may have established inadvertently with I.R.S. Because I may possibly be in error again (I was, in the past, when I filed) I have submitted affidavits for I.R.S. officials to fill out and sign. Affidavits that, if properly executed, would define the terms “money” and “dollar” and allow me to be billed for possible tax liability in a proper lawful manner. I want to pay my proper share for any and all services I receive, BUT I do not want have to bear false witness against myself to do it. I do not wish to violate my protection under the guarantees of the Constitution or to forfeit my privacy. I believe the best course to follow to enjoy individual liberty is to not give it up in the first place. If I.R.S. is a SERVICE, it is a service we can all live better without. The seriousness of I.R.S. extortion and fraud can only be understood after having observed it, up close, personally. Witnessing “trials” of I.R.S. victims and being witness for those victims in Federal District courts can be a most alarming “eye-opener.” Due Process — a right — guaranteed by the U.S. Constitution is completely denied, but the MANNER in which the denial is conducted, to those not completely knowledgeable of what due process should be, obfuscates the denial. The courts are where we are supposed to be heard and judged according to the law. However, when a judge denies a defendant his witnesses, that is not due process. During I.R.S. prosecutions of “income” tax victims, the courts act as an ARM of the I.R.S. instead of in their true function as a place for witnesses to be heard and those on trial to receive justice. Certainly all you have read so far must be logical and reasonable to you. How do you suppose the courts have managed to find AGAINST this logic and reason to declare I.R.S. victims guilty of not volunteering to be fleeced. Understanding as we do the function of the Judiciary we feel that anyone convicted was given a FAIR TRIAL and judged accordingly. Now it is time to show you otherwise. The reason the courts have allowed I.R.S. “income” tax fraud and extortion victims to be “railroaded” into prison is that they refuse to HEAR the very evidence that would free the victim. When the court (judge) DOES hear the evidence he makes sure the jury is ‘out of hearing' (sequestered) letting the jury believe that the evidence being offered is some sort of improper, unlawful, illegal or forbidden testimony. The jury ‘believes' according to the ‘conditioned reflex' it receives from the judge; never realizing that THEY (the jury) are the ones that are supposed to judge the testimony and evidence in a JURY TRIAL. When a judge in a federal district Court acts as an extended arm of I.R.S. to deny an “income” tax victim due process it is time to realize that some action must be taken to return the Courts to law and order! I would like you to judge the judge's behavior and actions under his oath of office to support and defend the U.S. Constitution, in the following excerpt from the proceedings in a federal district Court. The victim is being prosecuted for falsifying an I.R.S. W4 form. The victim wishes to establish before the court and jury that his act was due to confusion about his “liability” and how to get protection from I.R.S. tyranny without involving the Judiciary. I wish to reproduce here a portion of the court transcript of the proceedings that involved yours truly. The OFF THE RECORD discussions will be reproduced in script to the best of my recall. To be sure you understand it clearly, ALL of the following was conducted OUT OF HEARING of the jury (the jury was taken out of the courtroom before I was allowed to speak. The off the record discussions are between the judge and myself, as witness, with only a possible ‘off the record' tape recording being kept of what we said to each other. 19 are on a letterhead, says: “Merrill M.E. Jenkins, Sr., M.R. 20 Monetary Realist.” The Court has had occasion to read these. 7 value, end of quote, of Federal Reserve Notes? 8 THE WITNESS: No, sir; no, Your Honor. 9 THE COURT: You don’t have any question about that? 10 THE WITNESS: No, sir, they may be used, right. 13 they are not income as such, is that right? 15 to what is received is received by acceptance, by convention. 17 matter with Mr. Tissi? 18 THE WITNESS: Yes, I have, sir, Your Honor, yes. 24 THE WITNESS: No. sir, I have not. THE COURT: You did not advise Mr. Tissi not to pay his taxes? THE WITNESS: No, Sir, what I explained to Mr. Tissi is that he and everyone else has not had an “income” tax liability since June 24, 1968. THE COURT: He has had income from his job with the Post Office. THE WITNESS: “Income” tax liability is based upon earning and receiving “dollars” — federal reserve “notes” not “dollars” per se. THE COURT: But he uses federal reserve notes to buy things. THE WITNESS: Federal reserve “notes” are usable but only by passing them as counterfeit in an act of fraud. a MR. WILSON: Might ask him one more question. 9 THE COURT: You may. 14 THE WITNESS: I'm sure it has. THE COURT: Mr. Jenkins I understand your argument on the federal reserve notes, but the Supreme court has ruled that they are dollars for tax purposes and I must go along with their findings. THE WITNESS: But federal reserve “notes” are not the money of account of the United States; at best they only represent “monetized” debt and debt as income is not taxable! 4 currency in use in the United States. 5 THE WITNESS: Well, there isn’t any currency per se. 6 THE COURT: What do you want to call it? 8 the way I say it. 15 your documents I was of that impression. 4 in ‘74, ‘5 and ‘6? 6 he attended a lecture that I gave. 7 THE COURT: Well, that takes care of it. 11 sure myself, but we can look up the date for you. 15 THE WITNESS: That's right. 17 MR. WILSON: For the record as well I guess. 20 his contact with Mr. Tissi and his views as to, quote, money. 21 THE WITNESS: Yes, sir. 2 defendant objects and excepts to the Court's ruling. 3 Thank you very much. Bring in the jury. 6 category at this time? 8 to all of them. 10 Bank here is our witness. Same ruling with respect to him? 11 THE COURT: What's he going to testify to? 13 a dollar, what is the money of account of the Federal Reserve. 16 THE COURT: Same ruling. 18 THE COURT: Bring the Jury in. Shortly after the above part of the transcript the court recessed. The judge came into the courtroom and after stopping to converse briefly with others approached Mr. Jenkins. THE COURT: Mr. Jenkins what are you trying to do? Jenkins: Your honor, I'm trying to get this monetary situation corrected before the United States suffers a financial collapse and takes the rest of the world with it. THE COURT: But you should not bring it into my court room you should take it up with Congress. Jenkins: I have, your honor, but the members of Congress tell me to take it to the people, but the people are only interested in taxes and that is why I am in your courtroom. THE COURT: That may be so, but the Tissue's case is no the best vehicle. Jenkins: I agree, Your honor, but they will not pick on anyone their size, (gesturing towards the prosecutor Mr. Capes). THE COURT: Nevertheless I will not hear this argument in my courtroom. Jenkins: If we cannot get justice in your courtroom we will have to take it up in the court of public opinion. End of conversation in the public section of the courtroom. If objective reflection is focused on the courtroom proceedings recorded above, several very significant conclusions can be drawn. The Court: For the record, and I don’t question his testimony at all and I don’t question his expertise — what I'm saying is that the testimony he gives is immaterial, irrelevant and has no bearing on whether or not the defendant failed to pay his taxes. The JUDGE decided, my testimony, if I was allowed to give it before the jury, would be irrelevant and immaterial. To my understanding it is up to the prosecutor to challenge my testimony AS GIVEN (before the jury) and have the court rule on it. The Court: I will tell the jury that Mr. Jenkins is a monetary realist, that he has an opinion about the currency in use in the United States. Just exactly what is meant by: “However, they're not as learned or erudite as you are.” ???? If a witness has testimony that may be deleterious to the I.R.S. or “income” tax it will be forbidden to the jury. The jury will be forced to believe that there is no connection between Monetary Realism and “income” tax liability. The judge will — unlawfully — decide what documentation the defendant will be able to present to the jury. If you are learned and erudite on Monetary Realism as it applies to “income” tax liability you cannot be a witness for an I.R.S. “income” tax victim during his Federal District Court “trial." Such is the nature of the “income” tax trap that it cannot stand the light of day. It is so vital a tool to keep the people under tyranny that all systems are geared to protect this “unbelievable” “legal” criminal procedure! The public must, stop believing “dollars” exist, stop filling out forms admitting “receipt” of “dollars,” stop “supporting” the HOAX that will cause their nation to collapse into economic and financial chaos. The public must, accept the advice of George Washington, John Adams, Thomas Jefferson, Abraham Lincoln and others, refuse to be fooled any longer, stick to the words of the Constitution, demand action by Congress to specify, by law, what is current as money within the United States; which will end the HOAX and start the national recovery. No one should act without knowledge and understanding, no one with knowledge and understanding should refuse to act. Government by the people equals people owning the coinage which supports government. The Story of “Money” is unbelievable, but true. The resistance to acceptance of an unbelievable truth is embodied in the very meaning of the word unbelievable. The public has accepted, as truth, a series of beliefs that totally defy logic. Page 2, “Modern Money Mechanics” Chicago Fed. LIABILITIES ARE OBLIGATIONS TO PAY. INCOME AS DEBT IS NOT TAXABLE! Perhaps the public can be awakened by becoming enlightened to nature of “INCOME TAX” as a cruel HOAX on the non-bank public. That the nature of “INCOME TAX” is that of a cruel HOAX can be readily accepted if the above and below reasoning is considered objectively. Tax liability is based upon “dollar” income. Income is expressed in terms of “dollars.” Dollar is a unit quantity of whatever is, by law the money of account of the United States, but no one has disclosed or will disclose what is, by law, the money of account of the United States. TO DETERMINE ANY POSSIBLE RECEIPT OF DOLLAR QUANTITIES, ONE MUST KNOW what IS MEASURED IN DOLLAR QUANTITIES. Question: What information is required by I.R.S.? Question: Income in terms of what? Answer: Income in terms of dollar values. Answer: Yes! Dollars of equivalent money values. Question: What is, by law, the money of account of the United States that is expressed in dollar unit quantities? Dollar is the unit measurement of money. If dollars are money, how much money is a dollar? A dollar measure cannot be what it measures! There must be a money to be measured in dollars! What is, by law, the money measured in dollars? The quantity term “dollar” cannot be a thing received! The entity ‘money' expressed in dollar quantities is the thing received. Today “currency” is debt. What can be used to pay-off debt? If taxes were imposed on the “income” of debt — what can be used to pay those taxes? No revenue agent will explain what Missouri statute provides for the payment of Missouri taxes with Federal Reserve Notes or the modern Monetized debt “Currency.” Since Fed. “Notes” are not dollars what dollars are used to pay taxes? Money is measured in dollars. Dollars are amounts of money. Silver is no longer the “money,” but we still use the term dollar. What amount of what is a “dollar” today? Today’s “currency” is debt. Taxes are imposed on the ‘debt' being considered an ‘asset' — can there be taxes on incurring debt? If one piece of paper is labeled ‘one dollar,' how can one piece of paper be ‘ten dollars?' A “ten dollar” Federal Reserve “note” cannot BE ten “dollars,” it is a single piece of paper — it could not BE ten of anything. Was there ever a standard of value or was it in reality a standard of parity? If credit and debt are abstract ideas, could we ever measure them by the standard of any tangible thing? Can the mere denomination of anything as a “dollar” make that thing into a unit of value? Is it mandatory for a citizen to have to commit perjury to pay taxes? If Fed. “notes” are only valuable when passed as counterfeit, isn’t using them an act of fraud? Neither Dollars or Mermaids exist as tangible entities, how could anyone determine tax liability based upon the receipt of Mermaids? Knowing Dollar is a unit of measurement, how can anyone declare receipt of Dollar Entities under penalty of perjury? Wouldn’t admitting use of Fed. “notes” on official forms be an admission of receiving gain from the use of counterfeit in an act of fraud? Would confessing the use of counterfeit jeopardize individual protection under the fifth amendment to the constitution? If the privately owned commercial banks create the money, why does the public believe it is government that creates money? If government created the money, would government pay interest to borrow from the privately owned commercial banks? Since the “dollar” has never been a FIXED thing, how can it be anything except a unit of measurement in a system of measurement applied to various commodities? If the eye has ever really seen or the hand ever touched a “dollar;” what did the eye see and the hand touch? Isn’t the term “dollar” merely an abstract name, and not in any way a tangible thing having value? If merely accepting a Federal Reserve note makes it legal tender, then isn’t the public by its acceptance legislating FRAUD off the books of crime? If printing the word note on a piece of green paper makes it a note, could we not print the word orange on it and get juice from it? If mere denomination could make a piece of paper a “dollar,” then would it not cease to be a note? If it is a Federal Reserve note, why is it signed by government treasury officials? Since the word Dollar denotes a unit of measurement of the money of account of the United States, 31 U.S.C. 371, and as a unit of measurement LIKE Inch, Quart, Ounce, Pound, Dram, Peck, Bushel and Ton, would it not also be without Substance, Material or Being? Would it or would it not be a false statement to declare, under penalty of perjury, that one received Dollars consisting of Substance, Material and Being? What explicit instructions could there be for TRUTHFULLY declaring receipt of DOLLARS, in lieu of a commodity, specified, by law, to be current as money within the United States and to be expressed in DOLLAR unit quantities? Isn’t compliance with the 16th amendment to the U.S. Constitution (income tax) VOLUNTARY because it is REPUGNANT to Article 1, Sec. 2 of that same Constitution, which stipulates that all direct taxes must be uniform (equal amount for everyone)? Isn’t NOT filing an Income Tax Return in fact adhering to the U.S. Constitution and a PATRIOTIC DUTY for everyone that has unalienable rights guaranteed by the U.S. Constitution? What statute of Law supersedes the U.S. Constitution as law and makes upholding that U.S. Constitution a basis for prosecution? By what manner of reasoning, statute of law, or twisting of language can anyone be prosecuted for not doing what is VOLUNTARY? By following I.R.S. regulations does one or does one not waive his or her “… right to privacy …,” a PROTECTION, guaranteed by the Constitution of the United States? What explicit instructions could there be for filling out I.R.S. forms and for self-determination of tax liability without forfeiting the “… right to privacy …” guaranteed by the Constitution of the United States? Major premise: Congress has the power to lay direct taxes only if apportioned. Minor premise: The XVI Amendment allows Congress to tax without apportionment. Conclusion: Therefore, the tax allowed by the XVI Amendment is an indirect tax. Minor premise: The Supreme Court has ruled that the XVI Amendment is constitutional (Brushaber V. Union Pacific 304 US1). And they knew that if it was a direct tax it was in conflict with the Constitution and void (16 Am Jur 2d Sec. 177). So the only conclusion left is that it is an indirect tax. Major premise: An indirect (excise) tax is a tax on a privilege. Minor premise: I have been granted no privilege by the United States. Conclusion: Therefore, the income tax, through the XVI Amendment cannot apply to me. Major premise: An indirect tax is a tax upon some right or privilege or corporate franchise, (Madison Suburban Utility Dist. v Carson 232 SW 2d 277). The terms excise tax and privilege tax are synonymous (American Airways v Wallace 57 F 2d 877). Minor premise: A privilege is a particular and peculiar benefit or advantage enjoyed by a person, company, or class, beyond the common advantages of other citizens. A right, power, franchise or immunity held by a person or class against or beyond the course of the law. These taken from Black's Law Dictionary. But I have been granted no benefit, advantage, immunity, etc. from the United States Government. So I have no privilege. Conclusion: The XVI Amendment income tax cannot apply to me. There is no other choice of conclusions. Major premise: Congress shall make no law abridging freedom of speech. Minor premise: But being forced to fill out a 1040 form and all the accompanying schedules does interfere with our freedom of speech. Conclusion: The law which forces us to fill out a 1040 form is void, and inapplicable to us, who do not want to speak. Major premise: There can be no argument here because this is a quote from the 1st Amendment to the Constitution. Minor premise: The freedom to speak includes the written word as well as the spoken word. And it includes the right to not speak as well as speak. So those of us who do not want to speak about our economic affairs have the right not to speak of them. Conclusion: I have the unalienable right of not conveying information. Minor premise: But being forced to fill out a 1040 form and schedules does violate the security of my papers and effects. Conclusion: The law forcing citizens to involuntarily file 1040 forms is inapplicable to individuals. Major premise: No argument here because this is a quote from the 4th Amendment to the Constitution. Minor premise: For those who like their privacy, the forced confession of their private financial condition is obviously a violation of the security of their papers and effects. Conclusion: This law is inapplicable to individuals. Major premise: Neither slavery nor involuntary servitude, … shall exist within the United States. Minor premise: But filling out a 1040 form together with schedules is involuntary servitude for most citizens. Conclusion: Therefore, for most citizens (those who do not volunteer) this law is inapplicable. Major premise: No argument here because this is a quote from the XIII Amendment to the Constitution. Minor premise: For most citizens this is a very disagreeable task. So much so that they seek help from CPA's etc. So it is certainly not voluntarily. It is involuntary. Black's Law Dictionary states Involuntary Servitude is the condition of one who is compelled by force, coercion, or imprisonment, against his will to labor for another. But coercion and implied force via the penalty laws is the reason most people fill out a 1040 form. And they do this against their will. Conclusion: Therefore, this law is inapplicable to those people who do not volunteer to file a 1040 form. At this point you must have formed some conclusions of your own. It is very easy to fall into an acceptance that to be involved in a conspiracy one must be a conspirator per se (be knowledgeable of it), but that is taking the word ‘conspiracy' too literally. 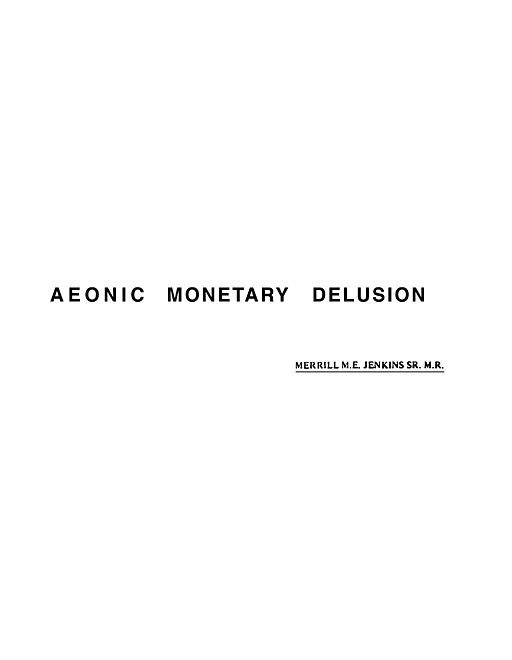 Almost all of the people we would THINK are to blame for this condition of “Aeonic Monetary Delusion” are NOT! Remember that everything about this condition is UNIQUE. If there ever was a word to describe it accurately it has been lost. Almost all of our elected officials are fully involved in the perpetuation of this condition, but DO NOT KNOW OF OR UNDERSTAND THE ROLE THEY PLAY IN IT. Rothschild Brothers of London said: “Those few who can understand the system (checkbook money and credit) will either be so interested in its profits, or so dependent on its favors, that there will be little opposition from that class … .” This tells us that there are few who understand the system of “checkbook money and credit,” but are there ANY, out there, who understand the Monetary Reality that the “checkbook money and credit” HOAX keeps hidden. Precisely: the system of (“Monetized” debt) as the machinery of total expropriation of public property and its redistribution without the knowledge or consent of the public. I would like to solicit your aid in obtaining answers to several questions that have been plaguing me for several years. I have directed these questions to various government officials and have never obtained a clear and satisfactory answer. Does the United States have any lawful money in circulation today? This may sound like a frivolous question to you, but if you will please bear with me perhaps you will grasp the significance of the question. Every day I use what is called U.S. Currency (federal reserve notes) AS money. I have been taught in school that notes are promises to pay money, so therefore, I fail to understand how federal reserve notes can be money per se. Furthermore, they are not redeemable in any specified thing which shall by law be current AS money from their issuers (the twelve privately owned Federal Reserve Banks that comprise the Federal Reserve System), nor have the federal reserve notes ever been declared by Congress to be current AS money or LAWFUL TENDER in all payments whatsoever in the United States. Certain occurrences in past history have prompted this question pertaining to some specific thing which shall by law be current AS money which I feel to be very pertinent to out present day economy. I have been informed by various officials of the United States Treasury Department and the Federal Reserve Banking System that the Coinage Act of 1792 is still in full force and effect today. Certain enactments of this so-called Coinage Act have been repealed by implication, i.e., removal of gold and silver coins (substantive money) from the hand of the citizens of the United States as current money. I can find no other enactment of Congress, subsequent to the said Coinage Act, declaring what is current as money in the United States today. These acts, and the lack of additional acts, give rise to the question first asked in this letter. In other words, if a person wants to be paid, he will be paid with units of monetized debt (federal reserve notes), which are no different than the original Treasury Bonds and Notes issued in the first instance, in that they are all obligations to pay. I am appealing to you personally, I cannot find such a delegation of power as described the Federal Reserve Bank of Philadelphia anywhere in the United States Constitution! I am aware of certain people who have advanced the question to various United States District Courts as to, “What is the money of account of the United States that is expressed in dollars?” The Courts have invariably answered that “Federal Reserve Notes are legal tender for all debts public and private.” I could relate such a procedure to the following exchange: QUESTION: What is an Orange? ANSWER: An Egg is a product of a Chicken. If I, as a holder of several credit cards, merely renewed my promise to pay for the goods and services I purchased on my credit cards each month, it would soon approach the point where the credit card issuers would demand final payment. If the case were such that I could not produce that final payment, my privilege of using the credit cards would be revoked. On the other hand, if I were privileged to have my promise to pay declared legal tender for all debts public and private, I would have no need of money since I could obtain everything that money can buy, by merely issuing my promises (notes) which would then circulate as money among the other citizens. Through this process, the other citizens would be paying my way. Another example of the credit card is the U.S. Treasury’s issuance of notes and bonds which are “purchased” by the Federal Open Market Committee, for the accounts of the twelve privately owned Federal Reserve Banks, by the mere act of telling the government, “You have “X” amount of dollars to spend, Now, print us up enough federal reserve notes to cover that money that you are going to spend.” Does the treasury ever redeem its notes and bonds or do they merely issue the same in like kind as payment of the previously issued bonds and notes? I feel that these are serious questions which go directly to the heart of inflation. As for myself, I do not recognize that word inflation in the same light as most citizens since they view it as being a rise in prices. I believe that any knowledgeable person who would stop and THINK would realize that inflation, pure and simple, is fiat money (money by government edict). The word inflation goes directly to the actual fact that the fiat money is “inflated,” or pyramided, thus giving rise to the actual conditions that plague our country today, namely, depreciation of the currency. Am I correct in this assumption? I have been told by certain officials of the Treasury and the Federal Reserve System that the value of the dollar is what one dollar will buy at any given time. Pursuant to this statement, isn’t the issuance of the fiat currency honestly telling us that he gets everything for nothing by the mere issuance and placing into circulation of the fiat currency? This seems logical to me since the issuer deals in nothing but money. Has Congress abused its usurped privilege to cause money to be created out of promiseless promises, or has the treasury gone beyond the powers delegated to it by Congress? I have been trying for several years to obtain answers to the questions I have posed in this letter. I have written several Federal Reserve Banks, the Federal Reserve Board of Governors, The Treasurer of the United States, my Congressman, my Senators and various officials of the Internal Revenue Service. I am in search of a simple answer to one essential question that no one will answer for me. Would you please use your influence with the Treasury Department to obtain answers to my questions for me. I would be forever grateful to you if you were only successful in having just ONE question answered for me, in full, that question being: WHAT IS THE MONEY OF ACCOUNT OF THE UNITED STATES, BY LAW, THAT IS EXPRESSED IN DOLLARS, PURSUANT TO TITLE 31, UNITED STATES CODE, SECTION 371? Thank you very much for any assistance that you should see fit to give me in pursuit of my quest for information. Merrill M. E. Jenkins Sr. M.R. Banks Being Conned by I.R.S. Ref: Letter to banks from District Director (St. Louis) Mr. Richard C. Voskuil (facing page). “Our counsel … “ Their counsel advised them — where is the statute, where is the case law: Does their counsel, BY HIS OPINION, make “… procedures authorized by the Internal Revenue Code …” into LAW? “If levied … about to be levied … or subject to levy … any person … shall, upon demand OF THE SECRETARY, exhibit … TO THE SECRETARY. “Because I believe it is mutually beneficial to avoid costly … legal actions to compel …” “… legal …” as opposed to lawful, but if the bankers do not know any better, then it could make them comply. Just another example of I.R.S. using fraud to extort information on the “private” (secret) property of the public. Ask for sample copy of The Orwellian Times.